"Inside Content Marketing" draws on incisive profiles and interviews with successful content marketers to demystify the discipline and present tactics and strategies that are working today. Content is only as good as the team behind it. From creation to distribution to measurement, it’s important to have the right people on your content marketing team. If you are working with the right people, success will follow. Information Today, Inc. (ITI) announced the publication of Inside Content Marketing: EContent Magazine’s Guide to Roles, Tools, and Strategies for Thriving in the Age of Brand Journalism by Theresa Cramer. Although a majority of marketers and brands have embraced content marketing, Cramer—editor of EContent Magazine—points out that relatively few firms are doing it well. She cites a recent study showing that of the 90% of B2C marketers who have content marketing programs, only 34% rank their efforts as effective. In Inside Content Marketing, the author’s guidance—drawn largely from profiles and interviews with successful content marketers and subject experts—is geared to demystifying the discipline and presenting tactics and strategies that work. She offers definitions and background, highlights minefields and misfires, and describes exciting new roles and opportunities for marketers, publishers, and journalists. Inside Content Marketing is organized in three parts: the first focuses on the marketer’s experience and what they need to know to create great content, the second makes the content marketing case for journalists, and the third helps publishers understand how they can capitalize on this shift in the marketing industry. Throughout the book, Cramer emphasizes that effective content marketing is the best way for companies to promote their ideas and grow their business. Theresa Cramer is the editor of EContent Magazine, where she covers the world of digital media and marketing. By night, she is a reader and writer of books, NPR addict, and avid gardener. She has worked in diverse publishing environments, from magazines and newspapers to books and the internet, for more than ten years. A Connecticut resident, she blogs about her adventures in home decorating (and whatever else strikes her fancy) at TheresaCramer.com. Follow her on Twitter @TheresaCramer. 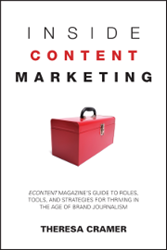 Inside Content Marketing: EContent Magazine’s Guide to Roles, Tools, and Strategies for Thriving in the Age of Brand Journalism (208 pp/softbound/$17.95/ ISBN 978-1-937290-06-1) is a CyberAge Book from Information Today, Inc. It is available in bookstores through Independent Publishers Group (IPG) and direct from the publisher by calling (800) 300-9868, (outside U.S. call 609-654-6266); faxing (609) 654-4309; emailing custserv(at)infotoday(dot)com; or visiting the ITI website at http://www.infotoday.com.